You know where to find NYC's best tacos, best nachos, and best Mexican food, period, which leaves one final frontier that needs Captain Kirk-ing: burritos. 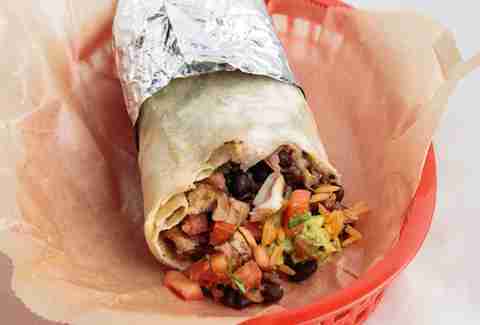 Set your phasers to food coma and make your way to one of these, the 10 best burritos New York City has to offer. This is a two-for-one deal. 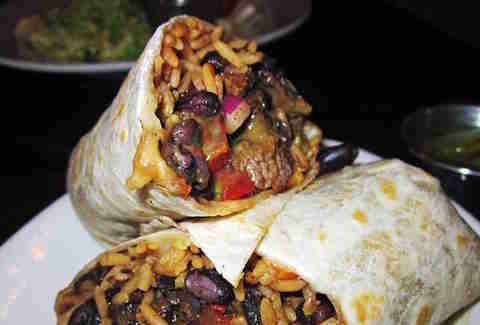 Within the Norteño burrito comes chorizo and carne asada -- two meats that could stand on their own, but come together here like Batman and Robin, if Robin were actually cool. There's a 50/50 chance Ratatouille will be on the TVs in Spanish, and a 100% chance you'll need a fork and knife to make your way through this plated burrito jammed with spicy and salty chorizo and tender steak. Also a fixture on our best nacho list, Taqueria Diana’s owner Matt La Rue spent a decade in San Francisco restaurants perfecting his burrito game before taking his talents back to NYC. The burritos (much like TD's nachos) are huge and good to the last drop, but unlike the nachos, you won’t want to share it. This burrito house is so legitimate it has the word "Tlaxcalli" -- tortilla in Nahuatl, the language of the Aztecs -- in its name. Just don't try to commute with its fork-and-knife-required tortilla bomb (or really try to commute with any foods in general) -- it's covered in a drizzle of black bean sauce, avocado sauce, chipotle salsa, and crema that work even better together as they do on their own. Two words: Crack Sauce. 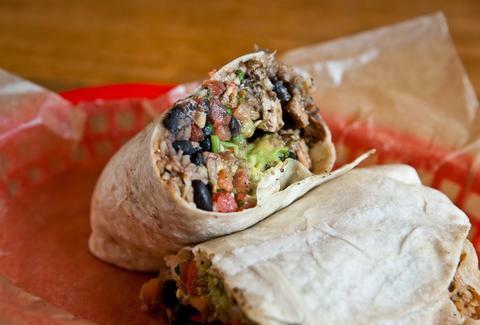 Five more words: put it on your burrito. 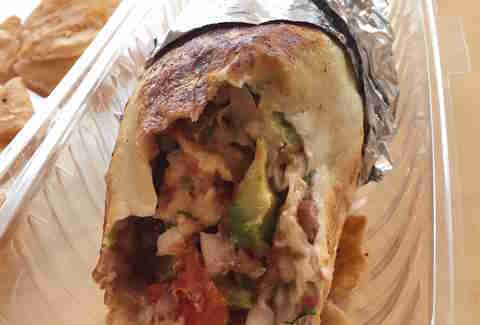 Whether it's from one of Calexico's trucks or newer locations, the burrito here would be worth writing home about if that was something people still did. Freshly grilled steak, or chicken in this case, is added to rice and beans with Calexico’s own avocado sauce, which is oh-so-deliciously next level-ified when you cover it in Crack Sauce. They start by melting cheese directly onto freshly made tortillas by Tortilleria Nixtamal in Queens that are delivered every morning. And where they go from there is kind of secondary. Inspired by the burritos of SF, this place loves burritos so much, its napkins feature eating guidance: "Unwrap and enjoy." 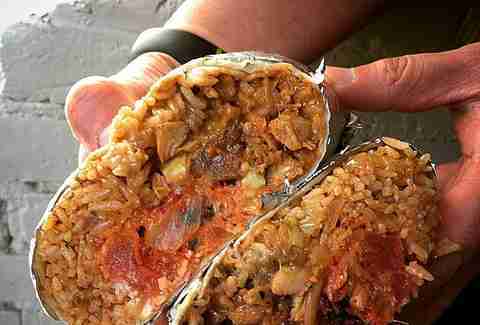 Long a truck and now a fixture of the East Village, Korilla has found a new, more Korean-y way to spice up a burrito: kimchi, bacon kimchi fried rice, and Korean-influenced meats, which lead to a burrito you won’t stop eating no matter how hard you try. Taqueria Tepango serves a short and very stout burrito with chicken tinga that draws you in and keeps you there with chipotle spice and salt and cheese melted atop the uniquely shaped tortilla. Inspired by San Francisco and delivered by a San Franciscan (pound sign legitness! ), these riceless burritos pack alllllll the flavors in (tender fried chicken, avocado, AND guacamole, plus a strong base of pinto beans). 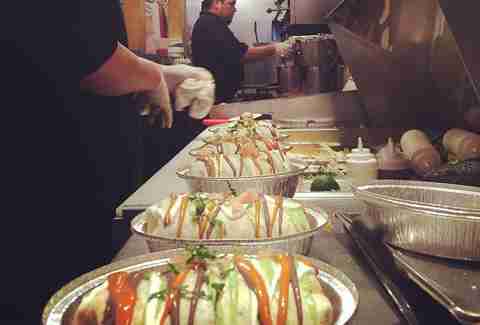 Don’t let the name fool you: though once a Mexican bakery, Downtown Bakery is now mainly pumping out delicious, wallet-friendly burritos. Featuring mole poblano-marinated chicken, they're a can’t-miss both for devouring by hand or by fork when covered in your salsa verde, roja, or both if you’re feeling saucy. In the back of a Mexican bodega -- with walls decorated with Mexican cowboys and both Mexican rap and a TV on -- you'll find Chinantla’s burrito. 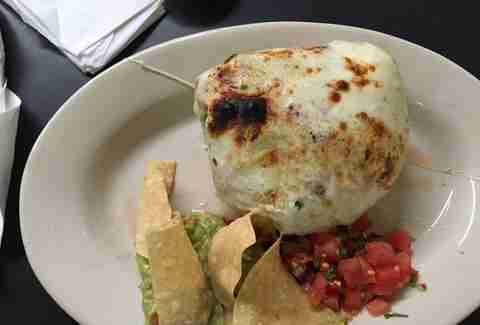 Its tortilla is adorned with a swizzle of crema and sprinkling of queso blanco and wraps around juicy pork with little chunks of pineapple. 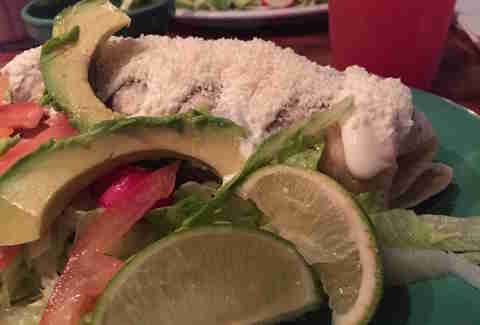 Bonus: each burrito comes with a side salad and salsa verde. Lee Frank is a nacho lover from way back when. If you follow him on Instagram or Twitter, you might catch a reference to pro-cilantro guacamole.